There are few case reports of corporal abscess in males, which are usually caused after trauma, intervention or infection. , These were managed with either incision and drainage or percutaneous aspiration. We are reporting an unusual case of spontaneous emphysematous periurethral abscess which involved the bilateral corpora cavernosa, and was managed endoscopically. A 48-year-old gentleman, with history of diabetes mellitus, presented to the emergency department with high grade fever, lower urinary tract symptoms and perineal pain for 3 weeks. Local examination revealed a mildly tender swelling at the penoscrotal [Figure 1] and perineal region. Gentle perineal compression resulted in pus discharge from the urethra. Per-rectal examination revealed bogginess over the prostate, but the trans-rectal ultrasound was inconclusive. An urgent computed tomography scan revealed a moderate sized periurethral collection around the bulbo-membranous urethra extending into both the corporal bodies, containing specs of air foci [Figure 2]. Urine culture grew mixed flora. The patient was taken up for cystourethroscopy, which revealed the bulging area near bulbo-membanous junction with trickling of pus. The prostatic urethra and verumontanum were normal. Prostate was de-roofed, but was completely normal. The most bulging point in the bulbar urethra was de-roofed, which drained 75-80 ml of copious thick pus. A suprapubic catheter was placed. His fever and toxemia resolved after drainage and broad spectrum intravenous antibiotics. A retrograde urethrogram after 3 months revealed mild narrowing at bulbo-membranous region, which was managed endoscopically. He was put on self calibration and remained asymptomatic after 6 months and didn't have erectile dysfunction. We performed a thorough search of literature, but didn't found any report of emphysematous abscess involving the corpora. Take home message: The periurethral and corporal abscess doesn't always require open or percutaneous drainage, but can be managed endoscopically with good results. 1. Moskovitz B, Vardi Y, Pery M, Bolkier M, Levin DR. Abscess of corpus cavernosum. Urol Int 1992;48:439-40. 2. Niedrach WL, Lerner RM, Linke CA. 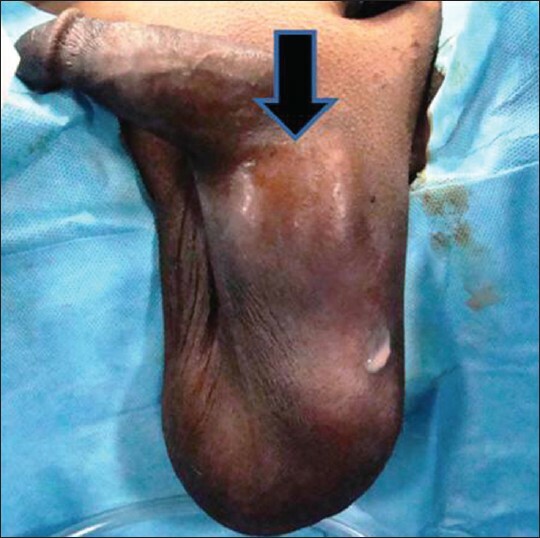 Penile abscess involving the corpus cavernosum: A case report. J Urol 1989;141:374-5. 3. Rosen T. Unusual presentation of gonorrhea. J Am Acad Dermatol 1982;6:369-72. 4. Yachia D, Friedman M, Auslaender L. Tuberculous cold abscess of the corpus cavernosum: A case report. J Urol 1990;144:351-2. 5. Thanos L, Tsagouli P, Eukarpidis T, Mpouhra K, Kelekis D. Computed tomography-guided drainage of a corpus cavernosum abscess: A minimally invasive successful treatment. Cardiovasc Intervent Radiol 2011;34:217-9. 6. Minami T, Kajikawa H, Kataoka K. Abscess of corpus cavernosum: Two case reports. Hinyokika Kiyo 2006;52:387-9. 7. Sater AA, Vandendris M. Abscess of corpus cavernosum. J Urol 1989;141:949.